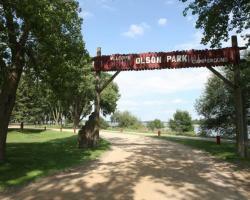 Olson Park and Campground was named after industrialist E.O. Olson and his wife, Bella H. Olson, who in April, 1945 donated 55.1 acres of land to the city, for use as park property. The area was officially named Olson Park in January, 1950. In October, 1956 approximately 10 acres, along County Road #59 was purchased for $3,000.00, from Genevieve E. Peters for future park site or possible well development purposes. Two additional purchases, totaling 2.498 acres, along County Road #59 were made in 1956 and 1966, from Agnes and Alvina Haack, with a small portion occupied by Welt Site #20. 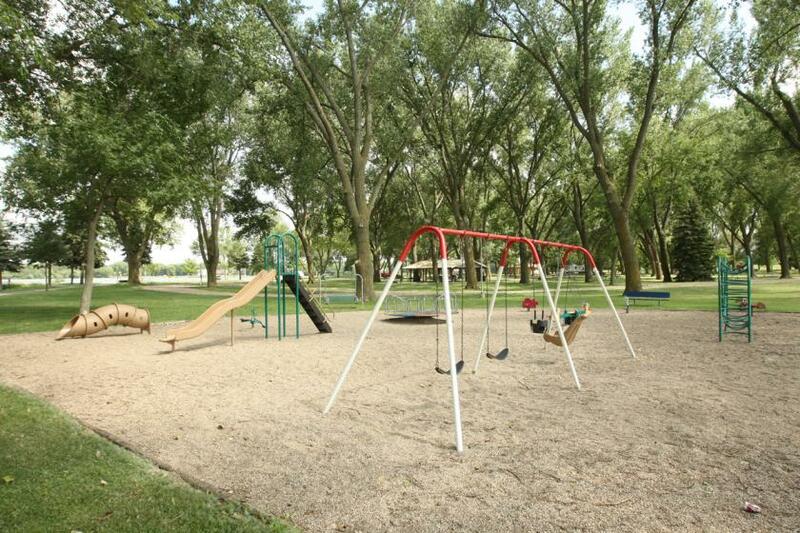 These additions have become known as park of Olson Park. Off street parking in designated sections. Electrical outlets in shelter house and at 63 camping spurs, see Campground Site Map. Water at shelter house, dump station, and one central hydrant. Five camping sites are designated for tenting. The dredge site area, of Sunset Park, is actually part of the Olson Park property. Playground equipment new in 2001. Wild Flower Native Prairie area located on southerly property entrance. Dog Park located at southerly property entrance. Installed new security lighting 2005. Restrooms are handicapp accessible. The campground has and continues to attempt to accomodate all persons with disabilities. Wireless Internet added in 2016, for more information contact the park attendant or check the park bulletin board. 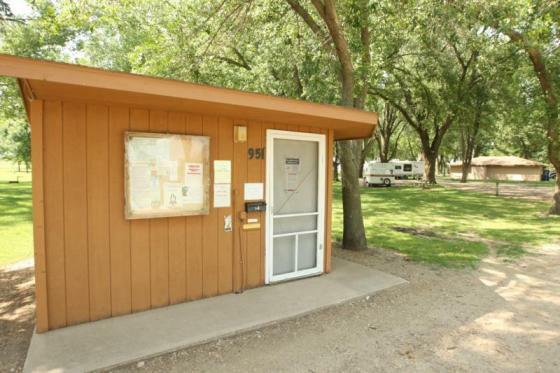 Olson Park Campground offers a quiet, friendly camping atmosphere. Open from April 1st to October 31st. Prices are as follows: $21.00 per day for non-electric, $27.50 per day for electric with the exception of sites 1-12 along the bay which are $32.00 per day. We also offer a weekly rate of $185.00.00 and a monthly rate of $475.00. Reservations are accepted with advanced credit card payment. To make a reservation contact us by phone at (507)329-0760. Need to Cancel? A 7 day cancellation notice is required. No charge if the reservation is cancelled 7 days prior to arrival. Full price will be charged if the reservation is not cancelled 7 days prior to arrival! A reservation assures you a camping spot. We will attempt to put you in a specific stall, however we cannot guarantee that the exact stall you request will be yours. 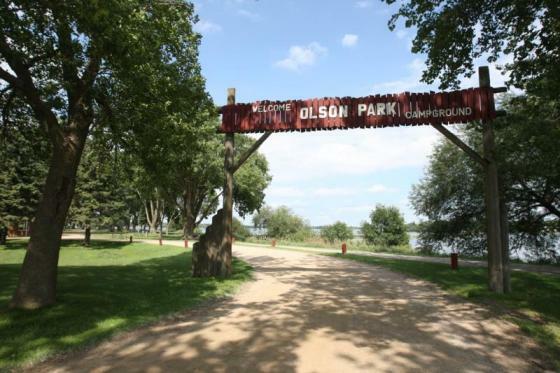 The City of Worthington welcomes you to come enjoy a pleasant camping experience at our beautiful Olson Park Campground. Located on the west shore of Okabena Lake along Sunset Bay. From Interstate 90, take Exit 42, go south on County Road 25, to County Road 35, go West one mile, to Crailsheim Road (County Road 10), go south two miles. For reservations, call the Campground Attendant, Barb Elsing, Worthington, MN at (507)329-0760.